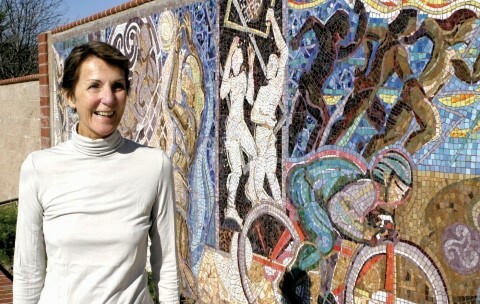 PUBLIC ART PROMOTER : Ann Ream, who sits on the SLO County Arts Councilâ€™s Art in Public Places committee, has been a tireless promoter of public art not only in San Luis Obispo but also throughout the county, encouraging other towns to follow SLOâ€™s lead and adopt a comprehensive public art policy. #In the past three decades, something remarkable has happened to San Luis Obispo, something unexpected and unusual for a city of its size: It has become a public art Mecca. Look around and youâ€™ll see art cropping up everywhere. From Jim Jacobsonâ€™s simple contemporary â€œSeven Sisters Railingâ€? on Santa Rosa Street between Marsh and Pacific to Elizabeth MacQueenâ€™s classical â€œIronroad Pioneersâ€? in Railroad Square â€” SLO Townâ€™s public art policy has fostered a remarkable array of public art pieces throughout our community. In a city facing tough budget problems, one may ask, â€œWhy spend money on art? Why concern ourselves with aesthetics at all?â€? Why indeed! Why bother with landscaping city parks? Paying for street sweepers? Enforcing architectural review? ROMAN BATH? : This tile mural by Cayucos artist Peter Ladochy at the new Kennedy Fitness Multiplex pool was created as part of the Public Art in Private Development program. Ladochy is also responsible for the â€œLove and Double Joyâ€? tile piece in SLOâ€™s Old China Town, as well as a Native American-inspired three-dimensional piece near the Cayucos pool. #Public art is an extension of who we are, our desire to adorn ourselves with not just sackcloth but with decorative fabrics, jewelry, fashion. Itâ€™s human nature (at least for most of us) to worry about appearances. Having the same interest in decorating our public environment as we do ourselves and our homes is perfectly natural. Many people are responsible for our vibrant public art program, but perhaps no one deserves more credit than Ann Ream, whoâ€™s been a tireless supporter as a member of the SLO County Arts Councilâ€™s Public Art Committee. â€œIâ€™ve witnessed how art in general can influence peopleâ€™s lives. The thought of walking down the street and encountering a piece of public art, which has the potential to make you pause â€” something we donâ€™t do very much in our lives â€” to pause and think about why itâ€™s there, why that design, might lead to critical thinking, not to mention the pure enjoyment of seeing artwork,â€? explained Ream. â€œIâ€™ve experienced that feeling in other cities, so when I joined the Art Council, I joined the Visual Arts in Public Places committee, and it has fascinated me to no end to be involved with a group of people sitting around a table talking about art in public places, what it means and how it can benefit a community.â€? FACILITATING ART : City reps (left to right) Jennifer Lawrence, Betsy Kiser, Jeff Hendricks, and Dan VanBeveren show about a dozen artists the new Damon-Garcia Sports Complex, discussing possible locations for new public art projects. Nearly $40,000 is set aside to fund public art at the sports fields. #Just how does public art benefit a community? In a town like SLO, where tourism is an important element to our economic vitality, a strong public art program can lead to a memorable visit. â€œIt been fascinating helping make public art a reality in this little burg, which is what it was when I started on this committee,â€? recalled Ream. â€œPublic art has savored the uniqueness of the downtown space. When I see these artworks, I think, â€˜I live here.â€™ These works are a part of my life and I take ownership of them, take pride in my community, and in pride thereâ€™s passion!â€? 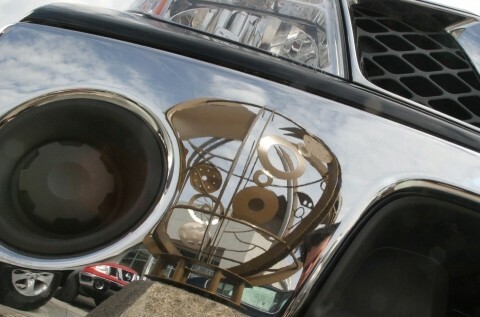 REFLECTING ON PUBLIC ART : Jim Jacobsonâ€™s â€œSphereâ€? at the BMW dealership in SLO Town is one of several pieces by the artist, whose work can also be found at the SLO Downtown Transit Center, the new housing subdivision at Madonna and Los Osos Valley roads, the Creekwalk at the Broad Street Bridge, the Parks & Rec Department on Nipomo Street, the Santa Rosa Street Bridge between Marsh and Pacific streets, and the Child Development Center. #Paso Robles wants one. Pismo Beach hopes to implement one by June. 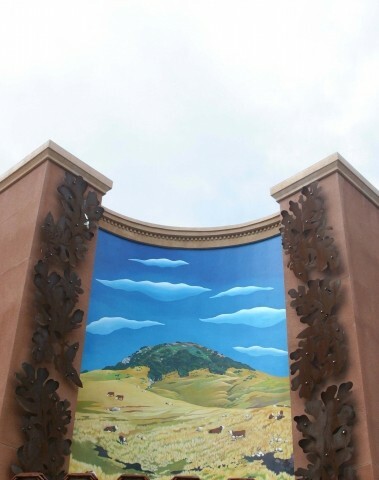 But so far, only SLO Town has a fully realized public art program. While communities such as Arroyo Grande have loose policies that â€œstrongly encourageâ€? developers to include Public Works-approved art, San Luis Obispo is currently the only community in the county to have a comprehensive policy that requires all new development â€” both public and private â€” to set aside a percentage of the cost of capital improvements toward public art. Former mayor and city councilman Ken Schwartz led the way in promoting public art in the city, and city planner Jeff Hook helmed the first policy requiring a percentage of building costs to go to public art. Later city worker Wendy George took over the program, and currently Betsy Kiser administers the policy. PUBLIC, MEET ART : Sandra Kay Johnsonâ€™s â€œHey, Diddle Diddleâ€? on Marsh near Chorro Street is, like her other work, perfect for viewing and touching. In fact, her â€œWeb of Lifeâ€? globe on the Creekwalk south between Nipomo and Broad Streets can be spun on its axis. Johnson also did â€œMinoan Tributeâ€? at the Utilities Department on Morro Street and the painted silk birds hanging from the ceiling of the SLO Airport. #â€œThe program started at 1 percent [of total project cost], but then tough financial times hit, and it was suspended altogether,â€? said Kiser. â€œIn 1995, the program came back at 1 percent, but later the city again faced budget issues, so the city staff proposed cutting the program to one-half a percent, but the City Council said no, instead setting it at three-fourths percent.â€? According to Kiser, the three-fourths percent figure is â€œjust a temporary thing.â€? It may go up to 1 percent again or down depending on budget constraints. â€œI donâ€™t know what will happen next year,â€? said Kiser. 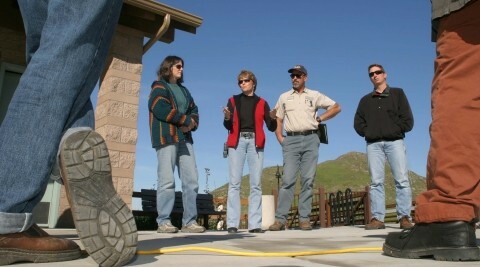 San Luis Obispo has three separate programs: The Visual Arts in Public Places program requires public-funded projects to set aside three-fourths of a percent of the total project costs (or capital improvements) to public art; The Public Art in Private Development program requires developers to set aside one-half a percent of the total costs over $100,000 to public art, not to exceed a total of $50,000; and the final program is Private Donation of Public Art, which happened with â€œPuckâ€? in the Downtown Centre, where a group of local families purchased the piece and donated it to the city. VERISIMILITUDE: When the Marsh Street Parking Garage blotted out the view of Cerro San Luis from the corner of Morro and Pacific streets, artists Carol Paulson and Stephen Plowman decided to create â€œMagic Sister,â€? a mural that recreates the view in paint. #â€œIf private developers donâ€™t want to do public art, they pay an in-lieu fee to the public art fund, which can be used in public projects elsewhere,â€? explained Kiser. â€œSometimes the amount due is so small, say $800, that developers canâ€™t buy much with it anyway, so it goes into the fund. Other times, developers choose to spend more on public art than required because they see the value of it.â€? All public art, even pieces donated by private developers or citizens, must be approved, such as the case when SLO Marketplace developer Bill Bird offered sculptures of horses and riders for his upcoming project on the Dalidio property. The sculptures, which were created in Texas, were turned down by the selection committee because it felt it didnâ€™t fit. â€œThe Dalidio farm is ag land, but not really ranch land, and even ranch horses are different than the bucking broncos these two sculptures depicted,â€? said Kiser. KINETIC! 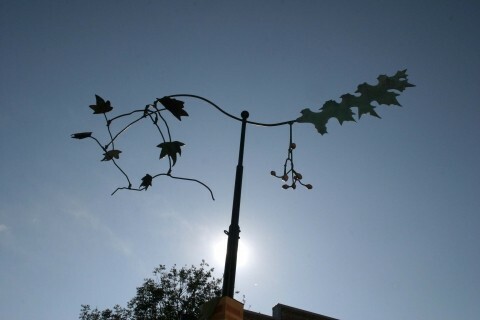 : Jim Jacobsonâ€™s kinetic sculptures on the Creekwalk near Broad Street connect to the local area via flora and fauna themes as well as Chumash Indian pictographs. #Ann Reamâ€™s favorite piece is Kate Brittonâ€™s â€œGarnet,â€? which became emblematic of the controversy inherent in public art. The piece was originally installed in Old Town Arroyo Grande, but many in that community felt its abstract shapes and message â€” it was meant as a tribute to breast cancer survivors â€” were out of character on the quaint street of turn-of-the-century buildings. When Arroyo Grande rejected it, San Luis Obispo happily announced that it would take it, and it did. Reamâ€™s least favorite public art piece is â€œThe Court of Historic Flags,â€? a series of bas-relief sculptures surrounding the flagpole in Mission Plaza near the SLO Art Center. â€œThat doesnâ€™t mean itâ€™s bad art,â€? explained Ream, â€œit just doesnâ€™t appeal to me.â€? OLD AND NEW : For SLO metal artist Jeff Thiesâ€™ â€œEvidence of Evolution,â€? recently installed on Los Osos Valley Road near Madonna, he used materials â€” granite, teak wood, copper, stainless steel â€” that were maintenance-free and subject to graceful aging. 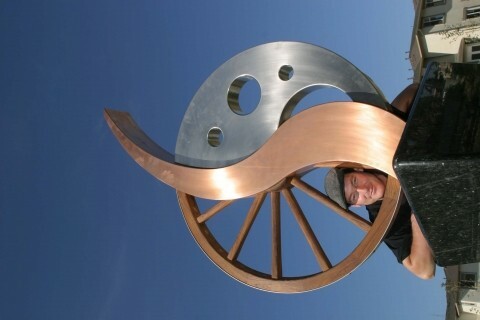 The piece itself features a wagon wheel to represent the areaâ€™s Old West past, a copper flame to suggest the industrial revolution, and a contemporary stainless steel post-modernist element that looks to the future. #Therein lies the double-edged sword of public art: People tend to love a piece or hate it. But thatâ€™s a good thing according to Kiser, who agrees that public art projects are always contentious. â€œAlways, always, always â€” and thatâ€™s the beauty of it. Youâ€™re stimulating conversation. Thatâ€™s what art should do: make people think.â€? Ream agrees that thereâ€™s no way to make everyone happy: â€œYou shouldnâ€™t set your goal in that direction because itâ€™s an impossibility. All the public art literature will tell you that. If you have a diverse group selecting the work, serving on the jury, your public art projects will be a reflection of the communityâ€™s diversity as far as taste in art. â€œWhat the Arts Council has done in working with the city is help formulate a procedure when putting together a jury that makes sure itâ€™s diverse â€” not bureaucratic but democratic. Everyone should have an opinion, and a diverse committee reflects your community: ethnicity, gender â€” itâ€™s all important when putting together a jury. The other thing that really helps is giving the jury good guidelines and criteria for judging: Is it appropriate in scale for the location, is it vandalism resistant, and so on.â€? San Luis Obispoâ€™s program has been slowly developing, moving from the relative safety of sweet representationalism (think Paula Zimaâ€™s â€œTequski Wa Suwa, Child & Bearâ€? 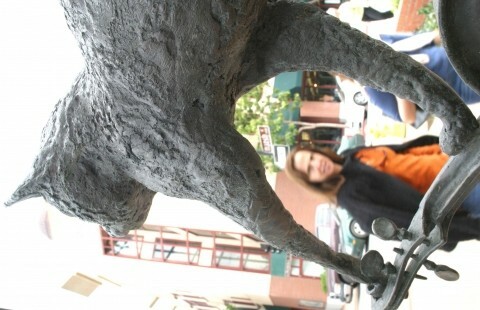 in the Mission Plaza fountain) to boundary-pushing contemporary art (such as Allen Rootâ€™s â€œFerromobiusâ€? on Chorro near Higuera Street). SHADOW AND LIGHT : In Alan Riggleâ€™s â€œBonding Danceâ€? on the Marsh Street Parking Garage expansion project on Morro Street, a contemporary design suggests powerful movement. 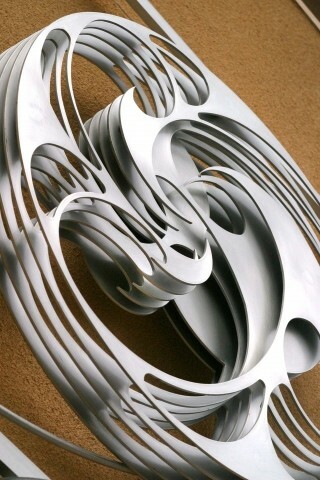 The look of the metal piece changes throughout the day as the light builds and dims. #â€œThe Art in Public Places committee has worked so hard with the city in coming to this point,â€? said Ream. â€œIt was important to begin with art that was safe. It was smart to do that. Now weâ€™re getting to the point where thereâ€™s more openness and risk-taking, which is exactly whatâ€™s happening at the Damon-Garcia Sports Complex.â€? In other projects, such as the Marsh Street Parking Garage, the city had set strict thematic guidelines, in that case a transportation theme. For the Damon-Garcia project, the city has offered no thematic guidelines. â€œThat project is wide open,â€? said Kiser, during a recent walk-through of the property, where interested artists could get a firsthand look at potential places where public art might be installed. About a dozen artists showed up, taking copious notes on site maps made available by the city. In addition to Kiser, on hand were project manager Jennifer Lawrence, engineer Dan VanBeveren (city project manager for the facility), and city maintenance worker Jeff Hendricks, who answered questions concerning electrical and water availability, where foundations could and couldnâ€™t be dug, right-of-way concerns for emergency vehicles, and so forth. Aside from such concerns, artists will have a free hand to submit whatever design they wish. â€œAs a result [of this new artistic freedom], the city has attracted an increasing number of public artists from throughout the country who are requesting notification on public art projects, and thatâ€™s fabulous,â€? said Ream. â€œIâ€™m hoping in the years to come, weâ€™ll get some art thatâ€™s really â€˜out there,â€™ and weâ€™re already heading that way.â€? Glen Starkey considers himself public art. Wax poetic regarding his ugliness at gstarkey@newtimesslo.com.